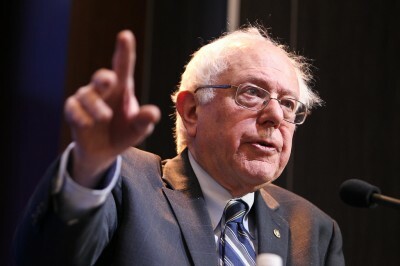 Emerging out of nowhere as a viable candidate for the Democratic presidential nomination, Vermont Senator Bernie Sanders is calling for a “Peoples’ Revolution.” It is obvious that Sanders is tapping into a deeply felt longing for transformation among the American people—as is Donald Trump—though of a progressive vs. Trump’s reactionary model. What is happening in America is of seismic proportions. Underlying the sense of the chaos, foreboding, and excitement as we watch both parties’ establishment leaderships crumble is the realization that the nation has gone deeply astray and that something must be done about it—now. Many thought change would come with the election of Barack Obama, and some did come. Inadequate as it may be, we do now have a semblance of a national health care system. There are in fact more jobs—of the low-paying dead-end variety. Interest rates remain low, so some people can still buy homes. And though the military-industrial-intelligence complex continues to dominate, at least Obama did not bomb Iran and backed off a military confrontation with Russia over Syria. But is it enough? Sanders and his growing army of followers clearly doesn’t believe so, though Hillary Clinton evidently does. If further changes are called for, as her “fight for you” slogan seems to indicate, it is impossible to tell exactly what those might be, if in fact the slogan means anything at all. By contrast, Sanders’ proposed changes are clear—a single-payer health care system, free public college tuition, political campaign finance reform, higher taxes for Wall Street and the rich, and fewer wars abroad. Sanders may actually be one of those figures history calls forth at times of crisis. The period we are going through is reminiscent of two other watershed eras in America’s past that brought unlikely heroes to the fore. One is the Civil War. From the time of the nation’s founding to the presidential election of 1860, deficiencies in the U.S Constitution, which legalized slavery, had led to an impasse, where the slave-owning states controlled the federal government, with the industrializing free-labor states pushed to the margins. Following the election of Abraham Lincoln in 1860 on the basis of only a plurality among four competing parties, the slave states seceded, and war swiftly followed. Lincoln prosecuted the war through issuance of Greenbacks and government bonds, raising of excise taxes, and the nation’s first income tax. The war resulted in an economic boom that created the basis for modern industrial development. For the next 40 years, progressives fought for a living wage and decent working conditions, even as the Robber Barons and big bankers moved to take over the economy. Their maneuvering culminated in the Federal Reserve Act of 1913. When the economy went under, the Republicans under President Herbert Hoover said that government could do nothing except watch and hope while private enterprise struggled to rebound. Roosevelt considered that option nonsense. A true democratic socialist, Roosevelt took over the reins of the economy and installed his own man, Marriner Eccles, as chairman of the Federal Reserve. Through massive social and economic programs, combined with Keynesian deficit spending. Roosevelt created modern America with its full-employment economy and prosperous middle class. But after World War II, the bankers and the rich again asserted themselves. During the first Eisenhower administration, the banks reached an agreement with the government to begin raising interest rates. Later, President John F. Kennedy made many enemies on Wall Street by his economic growth policies. Stagflation followed in the 1970s until the Federal Reserve crashed the economy in 1980 through unprecedented interest rate increases. The Reagan Revolution was based on the deregulation of the banking industry, followed by the promotion of overseas outsourcing of industry. The restraints were further removed by the Clinton administration with NAFTA and the repeal of the Glass-Steagall prohibition on the mingling of deposit and investment banking. By the end of the Clinton years the dot.com bubble had burst, and the economy was reeling. George W. Bush tried to pay for tax cuts for the rich and the wars in Afghanistan and Iraq by colluding with Alan Greenspan’s Federal Reserve to pump up the economy with the housing bubble, but by 2007 this too was collapsing. Barack Obama was elected in 2004 after agreeing to support the gigantic Wall Street bailout. Only the massive issuance of T-Bonds and their sale at zero interest to U.S. banks and foreign nations has kept the economy afloat, even as new trade agreements have been proposed. The prognosis remains dark for a country whose industrial dynamism is barely a memory. From the election of George Washington as the country’s first president in 1788 to Lincoln’s election in 1860, 72 years had passed. Remarkably, this is exactly the time period between Lincoln’s election and that of FDR in 1932. 72 more years brought us to 2004. By then, crisis loomed again, but instead of electing an epoch-making reformer, we got George W. Bush’s second term and an onrushing catastrophe. Then we got the false dawn of Barack Obama. Even as we speak, the crisis remains unresolved. I think we can say with some degree of confidence that the only candidate in 2016 who has a program that can solve the issues we now face is Bernie Sanders. Can it be that this poverty-born Jewish senator from the small state of Vermont is the Lincoln or Roosevelt of our era? Unlikely as that may seem, only time will tell. But first he must be nominated—and then elected. And that is up to us.